Previous chapter analyzed potential final energy consumption (FEC) saving while either improving or maintaining QoL. In other words, demand side analysis was the target of previous chapter without considering any economic limitation. The current chapter looks for potential improvement of QoL or at least keeping QoL by means of FEC and TPES together. Furthermore, energy supply constraint is added to ensure global energy supply and economic growth, which is the target of the sustainable energy strategy by IEA (Chap. 1, Sect. 1.4). 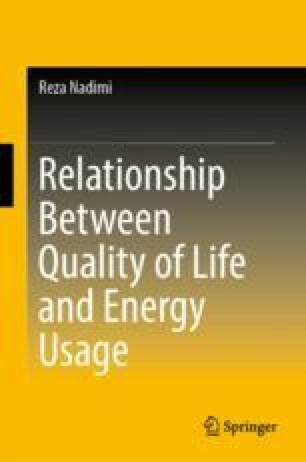 Thus, this chapter focuses on both demand and supply sides to investigate potential amount of energy reduction while either keeping or improving QoL. Previous chapter utilized the concept of efficient area to present three energy policies corresponding with three types of country classifications; developed, developing, and pre-developing. This chapter employes the data envelopment analysis (DEA) technique to measure the efficiency of each country [decision making units (DMUs)]. The energy supply constraint can be defined through an appropriate type of DEA model orientation in the supply side analysis. Moreover, considering the output-oriented DEA model in the demand side of energy ensures the economic growth related to the energy consumption. However, various energy related studies have used the DEA technique to measure the efficiency of DMUs. While, heterogeneous DMUs and either inappropriate input or output-oriented DEA model lead to unreasonable results. The K-Means clustering algorithm is applied for energy data to classify homogenous countries. The input oriented DEA model is performed for power stations (PS) under renewables. Whereas, the output-oriented model is used to examine the efficiency of PS under non-renewables and refineiries as well as demand analysis. The energy related quality of life (QoL) is the output variable of the demand efficiency analysis. The overall energy efficiency is calculated by multiplying the efficiency of supply side into the demand side. The results of this chapter specify that the highest potential energy saving (PES) source in the supply side belongs to the non-renewables in power stations, followed by refineries, and finally deployment of renewables. Demand side analysis identifies that the highest PES belongs to countries with high population, and high-income economy. In conclusion, the results of overall energy efficiency based on QoL, suggests an allowance for the use of fossil fuels in countries with weak economic and low population. The allowance is proposed to support energy poverty, health improvement, and promotion of education. See Tables 4.9, 4.10 and 4.11.